This is the season when we begin the autumn assessment of our garden season – the weather, our schedules, our successes, the failures and the not-quite-what-I- expecteds. I went into spring chores with joy and high expectations, but there was a disaster – the weather. Spring took a long time coming but by April 1 there were primroses budding. There were occasional snowfalls, but we did not have as wet a garden as we had had the past two years. We were full of anticipation as we planted some vegetables at the edge of the (usually) driest flower beds, and enjoyed pruning bushes that had grown so lushly. Remember, we were just going into our fourth year of gardening in Greenfield. I had been sent a book to write about in this column titled Strawbale Solutions by Joel Karsten. I had tried to grow some vegetables in a couple of straw bales some years ago with no more knowledge than that it took a straw bale and a plant start. That experiment was not a success. Strawbale Solutions gave very specific directions in preparing straw bales for planting so I thought I could not go wrong. I bought three beautiful straw bales from the Farmer’s Coop on High Street, and was assured that these bales were herbicide free. I also bought high nitrogen lawn fertilizer, as directed. On May 9th I began conditioning the bales, which mean spreading the proper amount of fertilizer on top of the bales and watering it in. I followed the schedule in the book for 12 days, and then I was ready to spread some soil over the top of the bales and planted green bean seeds and kept them watered as directed. The idea is that the conditioned straw bales will start decomposing on the inside, making compost that will provide the seeds and plant starts with nutrition to grow and flourish. The bales will need to be kept watered because they are porous and need to be kept damp. Long story short – the straw bales were a brilliant failure. I certainly cannot lay that failure on Joel Karsten. I have to confess that while I did keep the bales watered, I did not always do this with warm water which was a strong recommendation. Karsten explained that cold water right out of the hose did not encourage the growth of the bacteria that needed warmth to provide nourishment for the seeds or plants. It is also possible that the bales simply did not get enough sun. I knew they would not get morning sun, but I thought the afternoon summer sun would be more than adequate. Maybe not. The upshot was that I never harvested any beans, although there were a few sad looking specimens on the wire fence support. And it is just now that a little cherry tomato plant I put in has started producing ripe tomatoes. I take full responsibility for the failure of the strawbales. I do not take responsibility for the death of the beautiful weeping cherry, the pagoda dogwood, and the suffering of the calycanthus and lindera benzoin shrubs. The trees drowned and the shrubs struggle to survive. Heavy rains in July and into August were the culprit. The cherry and the dogwood have already been removed. We’ll wait and see if there is any spark of life in the Lindera benzoin and calycanthus for next spring. All the rain which was such a problem in my garden which has serious known drainage problems, was just what other gardens needed. There are two public gardens in town which thrived during the rainy summer. The renovation of the Energy Park gardens by a group of volunteers, Wisty Rorbacher, Judy Draper, Nancy Hazard, Linda Smith and Nancy Patteson continued this summer. The soil there is sandy, and there is no easy way to provide regular watering, so the many and heavy rains were a real benefit to the plantings there. This garden is designed to focus on native plants that will support pollinators in every season. The second public garden located on Pleasant Street is a new garden, a part of the landscaping around the new John Zon Community Center. Again, it is a group of volunteers that created this garden under the direction of Nancee Bershof and Tom Sullivan who also promote the planting of pollinator gardens. That garden began with generous loads of soil and compost from Martin’s Farm. A beautiful and productive garden depends on good soil, rain and sun. If only we could order up the proper amounts of each every year. How did your garden grow this year? Every year the UMass Extension creates a beautiful and useful calendar to teach, advise and remind us of our duties and opportunities all year long. COST: $14, bulk pricing is available on orders of 10 copies or more. Shipping is FREE on orders of 9 or fewer calendars – FREE SHIPPING ENDS NOV 1! FOR IMAGES IN THE CALENDAR, details, and ordering info, go to umassgardencalendar.org. The 2019 UMass Garden Calendar features the use of tomography to identify internal decay in trees. Many people also love the daily tips and find the daily sunrise/sunset times highly useful! These calendars always make a great gift for the gardeners in our circle. They will be available until Christmas – but after Nov 1, there will be a shipping charge. You might one for yourself, too. She Sheds like this one exhibit a very individual style. Two books, She Sheds Style and Upcycling Outdoors, have very different takes on creating stylish garden sheds and launching other projects for the garden. Every garden is unique because every gardener has different desires. Some gardeners want vegetable gardens, some want lots of flowers, some want art and glamour, and some want a practical fixture. Max Murdo is a gardener, and a thrifty handy man. He likes taking throwaways and then “conceptualizing an idea, researching, developing, making prototypes and finally displaying the finished product in all its glory …” He loves designing all kinds of things for the garden from simple but handsome hanging planters to a three door potting shed and an array of hanging lights. In his book Upcycling Outdoors – 20 Creative Garden Projects Made from Reclaimed Materials (Jacqui Small $29.95) Murdo provides clear how-to photos, showing each step along the way. Some of the pictured products are easy to put together, and require inexpensive materials, even if they are not to be found in the depths of the cellar or garden shed. I could easily image making a suitcase planter because while I don’t have any old suitcases of my own, I have seen them in thrift shops for very little. This project takes nothing more than an old suitcase, four legs, some plastic, and your own creativity for painting. Other projects may very well take a weekend like the three door potting shed. Out here in our rural part of the world it might be possible to pick up something like three doors at our transfer stations. The scope of the projects in this book ranges from easy like the plastic gutter hanging planter to more difficult like the bicycle wheel fire pit. You will be lured from one project to another, and the clarity of the photos and directions give confidence. Max Murdo has many strings to his bow and has shared his creativity and skills on television, at the Chelsea Flower Show, and won design awards. His work has been featured in galleries and exhibitions. She Sheds Style: Make Your Space Your Own by Erika Kotite (Cool Springs Press $25) is specifically devoted to sheds for the lady of the house. Ever since I visited a display of inspired and ingenious garden sheds at the Berkshire Botanical Garden in 2010 I have thought how wonderful it would be to have a shed that has more functions than for storing garden tools and equipment. Women are still looking for a room of their own and Erika Kotite’s book about She Shed Style describes the many ways a small shed can provide private space for sewing, painting, reading or socializing. Nowadays we have the advantage of the availability of prefab wooden sheds of various sizes, and Kotite suggests ways these can be taken from a standard to an original style. She also shows different ways that an existing shed can be refurbished, or rebuilt, sometimes using salvaged windows and other materials. While there is practical information and advice about building a she shed, the emphasis in the book is about style. Kotite’s she sheds range in style from elegant, cozy, shabby chic, and austere modernity and the whimsical. I was fascinated with the idea of weaving a Wild Vine She Shed built on an artfully painted wooden platform, with another painted canvas cover. Kotite really imagines many styles. Besides instances of styles, the great benefit of the book is the directions given for various projects which would be valuable in many places beyond a shed. Do you want a herringbone brick floor? Do you want to learn a variety of decorative paint techniques? Do you want to plant an espalier? Kotite has many ideas about using space, and about working with color. I found the lesson that explained color, its hues, tints, tones and shades helpful in explaining why some colors go together beautifully and effectively and others don’t. Kotite has been the editor for Romantic Homes and Victorian Homes and she has been featured in Architectural Digest, Oprah.com, NBC’s Today Show and other TV programs, as well as magazine and newspaper articles. Now that autumn is well upon us, and our days in the garden this year is limited it is pleasant to be able to sit in our warm houses and think about next year. What do we want to change or add to our gardens? What can we do without spending too much money? Upcycling Outdoors and She Sheds Style certainly provide food for creative thought. Stylish Sheds . . .
School gardens can be classed as one of the special classrooms in a school, offering fertile ground for children’s learning. In a school garden students of every age can learn to observe, learn about plant growth, about insects, about the life to be found in healthy soil, and much more. A school garden provides the first practical science lessons. Sunderland Elementary School has had a small garden for the pre-kindergarten and kindergarten classes. For some years these young children have been able to get their hands dirty and learn to use their eyes as plants are transformed from a tiny shoot to a flower or carrot. However, when they graduated from kindergarten they lost their garden and the fun and learning they had there. That loss was corrected. Early in the spring of 2017 Flora Cox, Amanda Berg, Darrel Beymer and Molly Wickline, who all work at the school in various capacities formed a garden committee. Deerfield Pharmacy, Sugarloaf Nursery, and Cowl’s Lumber provided the funding to buy the wood, screws, and chicken wire for the garden. Warner Brothers Construction donated 12 yards of soil while Atlas Farms and Riverland Farm donated plants. Other donors supplied trowels, gloves. Jeff Hubbard and his tractor removed the sod and leveled the site. The garden raised beds and fences were built by the garden committee members Cox, Berg, Beymer and Wickline with a big assist from Vinnie Cabriotti, a parent, and Douglas Cox, a horticulture professor at UMass. The 6th graders got into the act, too. Cox said “Mrs. Von Flatern’s 6th grade class made 3-D models of our garden from my scaled landscape design and also calculated a hypothetical supply list, a great real life math application which they loved. Last week I got to meet the garden committee and see the garden myself. Amanda Berg introduced me to Darrel Beymer and Molly Wickline and Flora Cox and gave me a tour of the garden that was built beyond the wonderful playground. Several children who were still at school for the after school schedule followed us into the garden. There were cherry tomatoes to eat, and even kale leaves to nibble. Cox told me that the garden lent itself to nibbling, but children and parents who stopped by the school during the summer to water (not often necessary this past summer) and weed, were able to take home a vegetable or two for dinner. “I was also surprised at the way the first graders ate that kale,” Cox said. Gardens are always a work in process. These students are observing and learning how the soil can be improved, and what crops would be best to grow next year. There is always next year. When we left the vegetable garden we made a stop at the large pollinator garden which is a Monarch Way Station. This big wild looking garden has plants that bees and butterflies like including butterfly bushes, coneflowers, milkweed and Joe Pye weed. The children are learning about the importance of these insects, and what they need. I thoroughly enjoyed my visit to this school garden, and I am happy to report that there are other school gardens where students of all ages learn to follow the cycles of the seasons, life cycles of insects and plants. Four Corners School in Greenfield continues the school garden they’ve had for about five years and involves all the children. I know of at least ten other school gardens. Amy Donovan of the Franklin County Waste Management District has put 30 vermiculture bins in school classrooms so children can see how worms live and how they make compost for the garden. The Hawlemont School has created a whole curriculum around agriculture called Hawlemont, Agriculture and You (HAY). They now have a barn for goats and sheep, a hen house, a greenhouse and gardens! Beyond classes children learn more agricultural skills in the afterschool 4-H clubs. 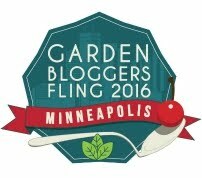 I missed Garden Bloggers Bloom Day in September because we were out of town for a few days. So now I am posting an early view of my garden – or perhaps I am just later. Either way, there was and is, still color as long as my ‘Alma Potchke’ aster is in bloom. No frost yet. Boltonia is a wonderful perennial blooming lushly and late in the season. Usually it doesn’t need propping, but with all the heavy rain this one is laid a little low. The boltonia next to a rose bush in the South Border can relax a little on the rose. This variegated Joe Pye weed is still in bloom, but the more common version which grows in a shadier spot in my garden is well finished for the season. My stand of chelone is substantial, at least 6 feet tall, and mostly upright, but again the heavy rains have given some stalks a bit of languid relaxation. The four winterberries in the garden are doing magnificently – Two red, one gold and one male. Please note that the winter berries, like the joe pye weed, amd chelone are all plants that often grow in the swamp. They are water lovers! Knowing that our garden was wet, we have chosen other plants (not blooming at this season) that are also water lovers – the dappled willow, elderberries, yellow twig dogwood, clethra and river birches. However, while the water lovers have thrived this year, other plants have struggled. On the other hand, there has been so much rain that this potted annual continues to bloom even though no one has been around to water it. And this nameless annual has grown happily all summer under the yellow twig dogwood, perfectly happy in the swamp. As I have always said, there are many mysteries in the garden. Apples and pumpkins are everywhere singing of autumn. It was recently pointed out to me that apples and pumpkins have a lot in common – aside from both being emblematic of the season. Apples and pumpkins are both low calorie, health supporting foods. We all know the saying ‘An apple a day keeps the doctor away’ but have we asked why this is so? What is it that makes apples delicious and healthy. Actually apples are mostly water, but they contain a good measure of fiber which is so important to the health of our gut. They are also made up of carbohydrates and the simple sugars, sucrose, fructose and glucose, which give them a low glycemic index. That means that blood sugar levels do not rise greatly after eating. This is a good thing. Apples supply vitamin C, and antioxidants that protect us from the damage caused by free radicals. All of these elements may help reduce the risk of cancer, hypertension, diabetes, and heart disease. Apples also supply B complex vitamins that are key in maintaining red blood cells and the nervous system in good health. What a wonderful fruit! It is true that the skin of the apple supplies most of the fiber and antioxidants. Cut the apple in pieces for your children, but don’t peel them. As a young person I used to think that the idea of serving raw fruit as a dessert on a special little plate and with a special little fruit knife was silly. Now that I am no longer young I have found myself following in my father’s steps, eating an unpeeled apple served on an ordinary little plate with a paring knife on many evenings. Or afternoons. Which is not to say that I don’t include apple crisp, applesauce cake and apple pie in my dessert repertoire. Most of us don’t make use of pumpkin in as many ways as are possible. We go as far as pumpkin pie and that’s it. Even there we have to be wary of the canned pumpkin that many of us use. Canned pumpkin is often squash, and beyond that it often includes sugar and water. Pumpkins are rich in vitamins and minerals, but like apples, they have a low glycemic index. Potassium in pumpkins has a positive effect on blood pressure. A cup of cooked pumpkin supplies more than 200 times the recommended daily amount of Vitamin A. The antioxidents in pumpkin also help prevent damage to the eyes. Pumpkin is a source of Vitamin E, Thiamin, Niacin, Vitamin B6, Folate, Iron, Magnesium and Phosphorus, and a very good source of dietary fiber, Vitamin C, Riboflavin, Potassium, Copper and Manganese. While people have been eating pumpkin of all sorts for thousands of years, the modern cook would be wise to look for a pie pumpkin or cheese pumpkin to use in the cakes, cookies, bread, soup, risotto or pasta of the season. We recently had dinner with friends who spent the first part of their lives in South Africa. They said that pumpkin was a staple of their meals, much as potatoes are of our American meals. While mashed pumpkin was an every day dish, they also regularly used it in soups, usually adding a half cup or more of applesauce. appetizing. Today my daughter Kate and I decided to make pumpkin soup from scratch with a bit of applesauce to celebrate the first day of fall. We found a seven pound pie pumpkin at the supermarket and began checking pumpkin soup recipes online. There are many pumpkin soup recipes to be found but there is great similarity between them all. My husband cut the pumpkin into eight pieces; this does take a little muscle. I cleaned out the pulp and seeds. We oiled each piece and put them in a 400 degree oven for about one hour. We cooled the pumpkin and removed the flesh from the rind. This is very easy. Heat oil in a 3 quart pot. Add diced onion and garlic. Cook gently till onion is soft and golden. Stir in cumin, cinnamon and the cutup apple. Add half chicken broth. Stir in the roasted pumpkin, adding more broth as you stir it in. Add cup of coconut milk. Stir and bring to a simmer. Puree with immersion blender, or regular blender. This is a basic recipe, but it is open to improvisation. You may want to use more or less broth, or real cream instead of coconut milk. Some recipes we saw added sweet potatoes, squash and carrots. Additional spices included varying amounts of fresh ground nutmeg, fresh grated ginger, chili powder, allspice, curry paste or powder, coriander, sage, and turmeric. Some recipes include substantial additions, cannellini beans, bacon and fried chickpeas, shrimp, rice noodles, fennel, quinoa and cooked chicken. Bon appétit.